Just Cause: The Movie may be overthrowing a theater near you soon, as the Eidos action adventure game heavy on the BASE jumping is being worked into a feature film. 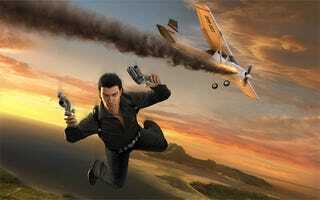 According to Variety, producer Adrian Askarieh is working to bring Just Cause to the silver screen, securing some $30 million in financing and still shopping for a studio. Askarieh has had success with Eidos games before, bringing Hitman to the screen and setting up a film adaptation of Kane & Lynch, set to start filming next year. Eidos and its Hollywood pals already have another Hitman sequel in the works as well as a Tomb Raider series reboot. No word (yet) on a Soul Bubbles feature film adaptation.